A key feature setting TKU Lanyang apart from many other universities is its All-English Taught Program, which also attracts many international students to enroll into the College of Global Development. Students represent thirty different countries from all over the world including diplomatic allies of the R.O.C and overseas Chinese returning for studies. Not only do the international student have the opportunity to learn about all Taiwan, but also have the opportunity to share different stories and perspectives, making Lanyang campus a vibrant and multicultural environment for all. 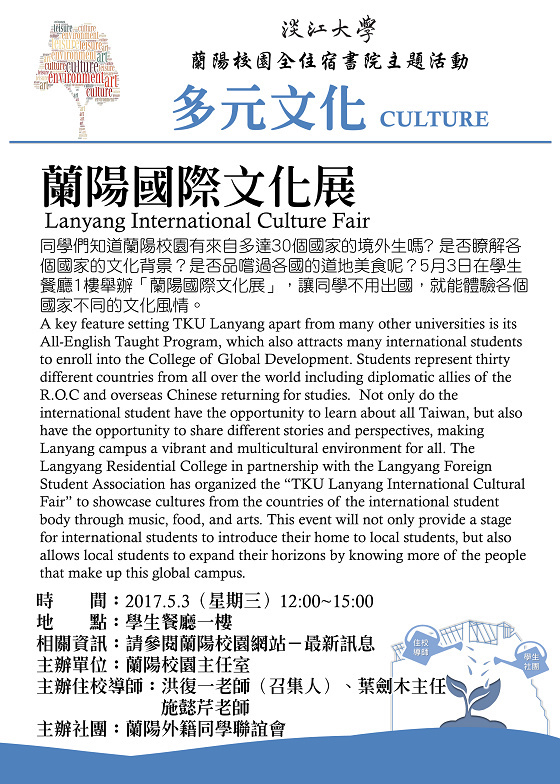 The Langyang Residential College in partnership with the Langyang Foreign Student Association has organized the “TKU Lanyang International Cultural Fair” to showcase cultures from the countries of the international student body through music, food, and arts. This event will not only provide a stage for international students to introduce their home to local students, but also allows local students to expand their horizons by knowing more of the people that make up this global campus.